The Race to Be “Best in Fresh”! | Supermarkets in your pocket. Home › Credentials › The Race to Be “Best in Fresh”! Do you eat your “5-a-Day”? If you do, you’re in a small minority – the shocking truth is that less than 10% of UK pre-teens and 35% of adults do so! Most of us crave guiltily for salty chips yet potatoes are not even an eligible vegetable in the UK 5-a-Day lexicon. We’re not alone – only 6 of the 28 EU countries meet the WHO target and we are shamed by consumers in Asia who have double the per capita consumption of fruit and vegetables than we do (mind you, North Americans are even worse than us which is cold comfort!). 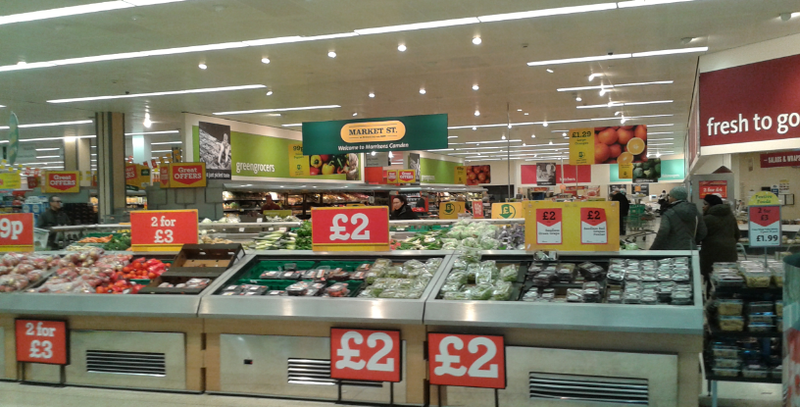 Morrisons is a British retailer trying harder to excel in fresh products. and the intrinsic seasonality of produce can add retail theatre if managed well as nature requires us to change our product offerings; although 52 week availability and lack of basic food education has done its damndest to destroy even the most simplistic consumer understanding of eating what’s in season. The renaissance of both consumer and retail interest in seasonality of produce is good for our health and good for supply chain members’ businesses. “First of the Season” fruits and vegetables are often the heroes of retail displays which can add much needed sparkle to the weekly drudgery of supermarket shopping …….. as long as those first long-awaited fruits actually deliver on juiciness and taste. Succulent fruits are a particular case in point where, too often, hope triumphs over experience (insipid peaches and nectarines, and perfectly round, perfectly red perfectly tasteless wasserbombe tomatoes come to mind). Forcing produce seems as unhelpful as forcing people – the result in both cases being a reluctance to deliver what was promised, although rhubarb may be an exception! 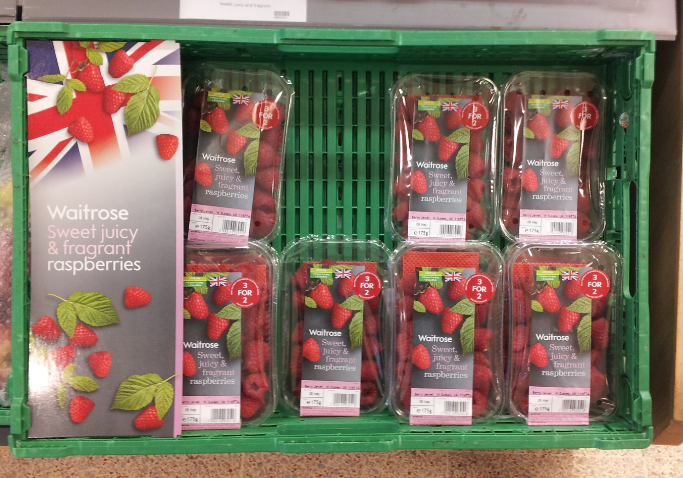 Waitrose was the first retailer to offer British grown raspberries this year. With shopper surveys around the world showing burgeoning interest in fresh food and, particularly, home-grown produce, shoppers can be too easily confused with an excessive SKU range. In his landmark book, “The Paradox of Choice”, Barry Schwartz warned of increasing shopper anxiety with too much choice – shopping for bagged salads, tomatoes, potatoes, and apples in some UK supermarkets induces neurosis when facing a wall of indistinguishable produce! But an additional confusing element for fresh produce shoppers is that one variety does not necessarily deliver the same benefits (taste, texture, etc.) week in week out – which is why putting a brand on a product grown in the ground which is open to the elements is so challenging. 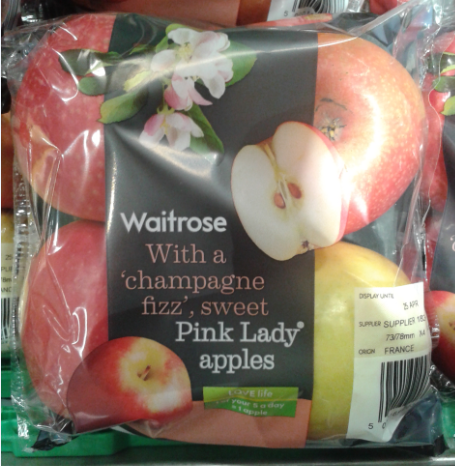 The Pink Lady apple brand has managed this well but it’s moot whether, say, Waitrose’s Leckford Estate-grown heritage varieties can do so, too. Romantic these old varieties may be but, like Summer holiday love, their allure may not be long-lasting! Pink Lady Apples. Great thanks to be constant in good flavour!